The large geographical barriers that protect Chile, including the Atacama Desert in the north, the Pacific Ocean that travels along the western coast, the imposing Andes Mountains in the east and the Patagonia with its Antarctic territory in the extreme south, blesses the country with a distinctive character that provides opportunities to practice adventure tourism activities in places that are practically untouched by man. These are just some of the reasons why Chile was chosen for the second year running as South America’s leading destination for adventure tourism in the World Travel Awards. Chile is the ideal place for adrenalin junkies and those who love to admire landscapes with incredible natural beauty. Skiing down mountains and volcanoes, the practice of water sports including scuba diving, surf, kayak and kitesurf in the middle of the Pacific Ocean, sliding down sand dunes in the desert, crossing extensive native forests in a canopy and enjoying fly fishing in the Patagonian rivers, are just some of the adventure alternatives and sports that can be enjoyed. Chile’s coastline of more than 4.000 kilometers is an undisputed paradise for those who love to surf. A good climate all year round, temperate water and a cradle of wild waves baptized “The Gringo”, transforms Arica into an obligatory destination for surfers all over the world. In Iquique, surfers are applauded for their magnificent performances on top of their boards, thanks to the perfect formation of the waves that roll out onto Cavancha Beach. For specialists who enjoy paragliding, the city of Iquique is considered to be one of the ten best places in the world to fly. In this area, between the Atacama Desert and the Pacific Ocean, not only are conditions perfect for flight, but the climate is also highly temperate, which makes beach life and outdoor activities very inviting. A few kilometers further south is San Pedro de Atacama, a town located in the middle of the driest desert in the world and a great base for the exploration of the amazing surrounding landscape. The Salar de Atacama, Moon Valley, the Geysers of Tatio and Salt Mountain, amongst other geographical accidents, can be found in the surrounding areas, motivating exploration and adventure. Trekking to the Laguna Lejía can also be enjoyed in San Pedro de Atacama. It’s an excursion that climbs to more than 4.000 meters and includes visits to volcanoes, hills and the impressive Laguna Miscanti. The volcanoes that surround San Pedro de Atacama act as permanent vigils over the landscapes. Climbing them is an experience that requires at least two days of travel. Licancabur, Láscar and Llullaillaco are three of the highlights. For those who enjoy mountaineering, the volcano Ojos del Salado is one of the greatest challenges on the planet. With 6.893 meters of altitude, it’s the highest in the world. It’s a challenge for the experts and puts the abilities of all mountaineers to the test. The Atacama Desert, the driest in the world, offers a real challenge for those who want to travel across and its gigantic salt lakes by bike. When descending down the coastal routes of the Pan de Azúcar National Park, the profound blue colors of its waters can be enjoyed, renovating the energies of all adventurers as they continue onwards with their journeys. A great place for scuba diving in the north is the Humboldt Penguins National Reserve, close to the cove, Chañaral de Aceituno, or Punta de Choros. As well as the marine background, it’s a place from which penguins, sea lions, otters and even whales can be observed. Even though they are in danger of extinction, Chile is home to more than 2.000 glaciers and most of them are unexplored. Close to Santiago, the country’s capital, it’s possible to visit some of them via walks between four and five hours. Glacier El Morado is located in the interior of Cajón de Maipo and its access route shows how, in less than an hour, the city surroundings rapidly convert into Mediterranean vegetation. For beginners, the Sierra de San Ramón and the city’s many hills, including Manquehue, are excellent alternatives. Scuba diving is one of the most prominent activities on the islands. The underwater paradise of the archipelago of Juan Fernández account with transparent waters, an immense quantity of fish, eels, lobsters and the playful two-haired sea lion. Easter Island’s temperate and crystal-clear waters offer a surprising and privileged visibility of between 40 and 60 meters. In this underwater world there are mysterious caves to explore and it’s possible to discover submerged Moai at Las Áncoras Reef. On the mainland, in the central zone, other places to go scuba diving include Los Molles and Pichidangui, close to Zapallar, or Quintay, close to Valparaíso, where it’s possible to scuba dive around a shipwreck. During the winter, the snow that falls in the central zone of the Andes Mountains paves the way for some of the best ski slopes in the southern cone. Activities are available for experts, beginners, travelers and adventure junkies along this imposing mountain range, the vertebral column that travels along the length of Chile’s territory. Skiing is, of course, one of the highlights, but snowboard, tubing, randoné and walking with snow shoes can also be enjoyed. A must-have adventure in the central zone centers the trails that run through La Campana National Park, close to Valparaíso. Declared a World Biosphere Reserve, hiking opportunities include an eight-hour trek that travels through the marvellous routes of century-old Chilean palm trees. The world capital for surf can also be found here. Punta de Lobos, in Pichilemu, receives wave-loving adrenalin junkies to its marine currents, offering waves that surpass the four-meter mark and provide enviable conditions for gliding on top of the sea. Waves that crash against the rocks in bays including Dichato and Buchupureo, close to Concepción, put the dexterity of surfing experts to the test. Kayaking opportunities, concentrated in the central zone to the Patagonia, offer routes of different intensities, accompanied by magnificent landscapes and an abundance of native fauna. As a way of easing into the challenge of maintaining balance, the peaceful waters of the Maipo River in the Metropolitan Region are well recommended, and later on the waters of Maule Valley. When it comes to rafting, the central and southern rivers of Chile offer a fascinating experience full of adrenaline and adventure. Their impressive descents, powerful flows and abrupt estuaries that break out into the Pacific Ocean, convert them into a true delight for rafting adventures. Beginners can try their hand atop a raft in low intensity currents on rivers such as the River Maipo, located a few kilometres outside of Santiago. To enjoy the experience in a group, the River Claro, located in the Siete Tazas National Reserve, is the ideal place. The Huerquehue National Park never fails to surprise with the Lake Caburga, and the Villarrica National Park with the ascent to the volcano’s cone. In these demanding landscapes, climbs must be attempted with the help of crampons to help reach the summit. It’s also possible to enjoy a similar experience at the Torres del Paine, where it’s possible to travel along routes completely untouched. 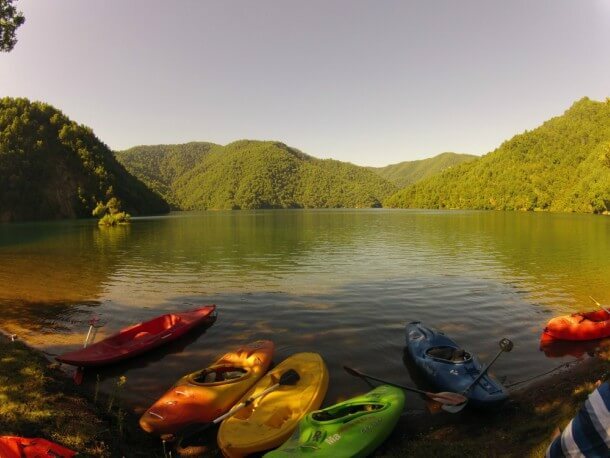 Those with more kayaking skills can try their luck in the surrounding areas of Pucón along the Trancura River, or enjoy the woodland landscapes of Lakes Caburgua, Calafquén, Conguillío and Riñihue. For anyone looking to try a faster rafting experience, the rafting tourist centers close to Pucón are a good option, with opportunities to raft along level IV and V rivers, Trancura and Liucura. If you’re an expert, the great challenge would be to raft along River Futaleufú in the middle of the Patagonia. Surrounded by breath-taking landscapes, its level V rapids are characterized for their length, flow and exciting descents. Another must is the River Baker. Its turbulence and turquoise waters make the adventure and unforgettable experience. The Carretera Austral, stretching along for more than 1.200 kilometers from Puerto Montt to Villa O’Higgins, is the ideal place for cycling lovers to visit. The best part of this route is comprised of pebbly roads and requires an adventurous and patient spirit as the trip can sometimes be pretty tough. Even so, the effort that it takes is more than worthwhile. At every kilometer, there are incredible places to photograph: forests, rivers, waterfalls, lakes, fjords, mountains and glaciers. It’s also an ideal place to practice fly fishing, along rivers Simpson and Baker. In the south of Chile, it’s also possible to enjoy fly fishing, trolling and trawl fishing. An alternative is to contract a seaplane service to visit unexplored territories, including the waters of the River Grande, Tierra del Fuego, where it’s possible to catch the giant brown trout, a species that weighs more than 15 kilos. These are true trophies for expert fisherman, those who practice the return of fish to their natural habitat in order to take care of the environment. 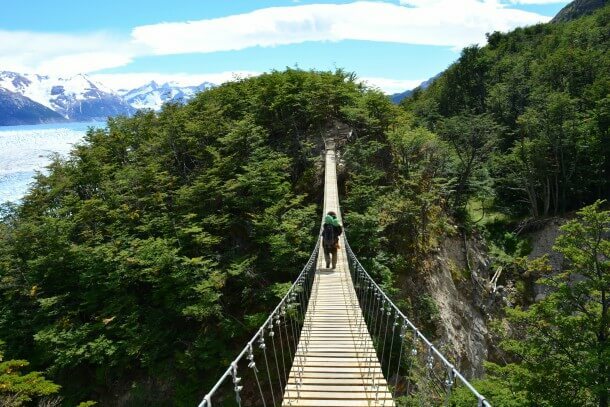 For hiking and trekking lovers, the Patagonia is a must-visit destination that offers dozens of national parks and reserves with a variety of routes at different levels of difficulty. One of them is the Torres del Paine National Park in the Chilean Patagonia. This place was declared a World Biosphere Reserve by UNESCO in 1978. It’s a protected area of 227.000 hectares with an interwoven range of ecosystems that include lakes, glaciers, rivers, extensive meadows, waterfalls, forests and its very particular granite towers, which have positioned Chile as one of the best natural destinations on the planet, according to the magazine, National Geographic Traveler. The park has some of the best routes in the world to explore. One of its most famous circuits, the W circuit, was selected by the magazine, Lonely Planet, as the best multiple-day trek, without demanding altitudes, in the world. For those adventurers who are more experienced, there’s the O circuit. Walks across the ice are breath-taking panoramas. One of the largest extensions of ice in the world is located in the Chilean Patagonia, the ideal site for experiencing this kind of adventure. We recommend exploring these millennial constructions of congealed water, hidden within the Torres del Paine and Laguna San Rafael National Parks. Explore the adventure and discover the variety of cracks, rivers and tunnels that are formed between the glaciers, while experiencing the Yelcho Snowdrift along the Carretera Austral.